TMA has a wonderful garden where students get to enjoy and learn about planting. We have parents, classroom Garden Masters, who help us each month in the garden with our lessons and activities. We also have Master Gardeners who teach our classroom Garden Masters all about gardening and tying academic concepts to work in the garden. They were trained and certified as Master Gardeners in the amazing University of California Continuing Education Master Gardener Program. The two Master Gardeners who graciously volunteer their time in our garden are Teena Spindler and Joanne Byrd. Teena has been our very own TMA Master Gardener since our garden started when I was in first grade. She had a big part in helping make our garden what it is today. What she likes most about gardening is the beauty and perfection of flowers and vegetables. Teena started gardening when she was 8 years old and her mom gave her a packet of flower seeds. She chose to give her time to TMA because gardening is important in her life and she wants to teach children about it. 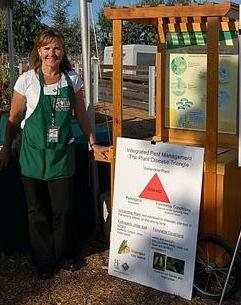 She likes to be on the team of gardeners here at TMA because our garden programs are so well organized and managed. What she loves most about helping with the TMA garden is hearing stories of what the kids have experienced in the garden and hearing about how some have started their own gardens at home. Our second Master Gardener is Joanne. She came on board last year when our programs expanded to include all grade levels, and Teena needed some assistance. She has been gardening for more than 35 years and likes it because it is relaxing and she likes to grow tasty vegetables. She chose to become a Master Gardener when she saw how much fun her grandson was having in the garden. She decided to volunteer as our second Master Gardener so she could work with other kids. She enjoys teaching kids how to grow plants so they can grow some at home. As kids, we have enjoyed learning new things about gardening at TMA because of Teena and Joanne. We’re really lucky Teena and Joanne help with the TMA garden. We think they are the best Master Gardeners in town. I have learned about growing plants, weeding, worm composting, planting seeds and watering plants. My favorite time in the garden was when I got to try a strawberry that was grown in my own school garden. I look forward to going to the garden because it is a great time there. I’m thankful to the Master Gardeners and parent Garden Masters because they have provided a wonderful garden for us to explore.